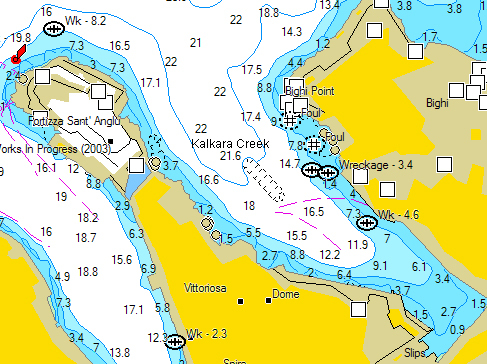 This is the second creek to the port side on entering the Grand Harbour. There is a very picturesque village overlooking the bay. It is easy to obtain services by road to the yacht which could temporarily come astern to the road in front of the Kalkara Boat Yard. In this creek one finds Kalkara Boat Yard, a modern, safe and secure boat yard which operates lifts up to 35 ton for hauling out, for repairs and for winter layout. It is a self contained yacht yard, specialising in joinery work, repairs, conversions and rebuilts, as well as having its own engineering workshop. Whether intending to make use of the yard or not the creek itself is worth a visit. Possibly an overnight stay to benefit from the peace and quiet which it offers.